And as for the good land, its vegetation cometh forth by permission of its Lord; while as for that which is bad, only the useless cometh forth (from it). Thus do We recount the Tokens for people who give thanks. Wal-baladut-tayyibu yakhruju nabaa-tuhuu bi-‘izni Rabbih. Wallazii khabusa laa yakhruju ‘illaa nakidaa. Kazaalika Nusarriful-‘Aayaati li-qaw-miny-yash-kuruun. Baladu – (a city, a town), actual it aims – that part of land, which is, whether fertile or barren, cultivated or uncultivated, a collection of nearby parts of land are called baladah, in which some portion of land may be populated and some un-inhabited. This word has come in the previous lesson too. On both places, it aims – the land and its population, which is called a city or a town. Yash-kuruun – (they give thanks), its origin is shukar. Shukar means “to admit someone’s kindness”, only that individual accepts who recognizes that, it is good, which has been given to me (him). Therefore, translation of this word would be here: those people who understand that they have been given good thing. It was explained in the previous lesson that Allah Almighty sends raining water with His Kindness to bring the dead land to life again and freshness is produced with it in dry ground and then vegetables, grass, fruit and flowers of various sorts come out from it. It has been mentioned in this verse that: Rain is good for the entire land, in which, power of giving life to it exists, but proficiency of the land has some interference in it also. The good land will gain more advantage from the rain according to its ability, vegetables, greenness, useful grass; the trees of fruit and the plants of flowers will grow in it, whereas, if the land is bad for example; barren, saline or stony, then the rain will not be so much useful for that land. First of all nothing will grow there, but if something grew, that would be difficultly, very less and maximum from it would be useless thorny bushes etc. It is commanded that it is Our way of causing to know that We explain Our Revelations in different forms and change their words for dictation, so that the wise people and thanks givers reap advantage from them. And He it is Who sendeth the winds as tidings heralding His mercy, till, when they bear a cloud heavy (with rain), We lead it to a dead land, and then cause water to descend thereon and thereby bring forth fruits of every kind. Thus shall We bring forth the dead; that haply ye may remember. Wa Huwallazii yursilurri-yaaha bushram-bayna yaday rahmatih. Hattaaa ‘izaaa ‘aqallat sahaaban siqaalan- suqNaahu li-baladim-mayyitin- fa-‘anzalNaa bihil-maaa-‘a fa-‘akhrajNaa bihii min- kullis-samaraat. Kazaalika Nukhrijul-mawtaa la-‘alla-kum tazakkaruun. ‘Aqallat – (bore, burdened), it is past tense, origin of which is ‘iqlaalun. This word has been derived from qillatun. Actual meaning of it is “to be less” and its opposite word is kasratun (to be more). Many words are made from it as “’aqli-yat, qillat, qaliil etc.” After that, its meaning became “to burden, to bear”, because any loader will lift anything at that time, when it will consider the load less than its capacity. In this meaning, the word ‘iqlaal is used, which means “to bear”. One more word ‘istaqlaal also has the same meaning, that is to say; to pick up own weight at one’s own, and consider it less, whether it is heavy, and without getting support in this matter from any other. In this verse, those things regarding rectification of the earth have been mentioned, which Allah Almighty has fixed with His Omnipotence, and in which any mankind cannot interfere. It is commanded: Behold! In what manner Allah Almighty has arranged to rain on the land with His Mercy? At first, the pleasant winds blow. Then those winds bring the clouds collecting from hither and thither. After that, Allah Almighty showers down the water on the earth from it. Resultant, delicious fruit and beautiful flowers come out from the land after raining. Think over it and you will come to know that as Allah Almighty brought the dead land to life with His Mercy causing to rain the water, similarly, He will bring to life the human beings after death. Being dried or parched of the land is just like its death. You see that Allah Almighty brings it to life again through the rain, in like manner, He has such sources, with which, the dead humankind will come back to life and after being alive, the human beings will acquire reward or award against their good or bad deeds. But remember it that: Reap advantage in this world from spiritual rain, which Allah Almighty poured down through His Prophets, Messengers (peace be upon Them) and Holy Scriptures, if you wish to prosper (bud and blossom). 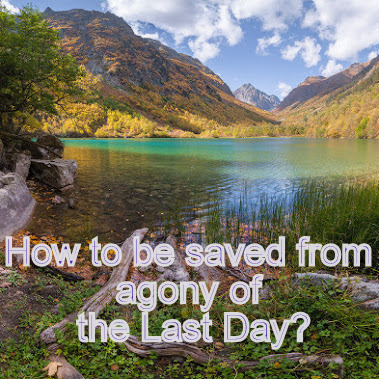 How to be saved from agony of the Last Day? Three verses of that Section end here, which was begun from Lesson # 857. We should not go forth without considering it well. Holy Qur’aan teaches us itself that we should recite its verses and stay at considerable point for thinking that: What these verses desire to instruct us? Therefore, we should consider into them thoughtfully twice, thrice or as much as we can. At the end of the Section, previous to this, it was described that when the evildoers and disobedient people will see with their own eyes the agony of the Fire of Hell and blessings of the Garden, they will scream spontaneously: Those Messenger (peace be upon Them), whom Allah Almighty had sent unto us in the world, they used to speak the quite truth. Would that we have any intercessors today, who may intercede for us, so that we may be delivered from this severe torment and we can be returned to life on the earth that we may act and show becoming obedient servants of our Lord. After that, it was told that “they have lost their souls having trust in their baseless views. After drawing so much clear plan of heart-breaking future event, it was necessary that the method of “How to be saved from that agony” was required to be explained clearly; so that the human being would not have any such reason that “We were not caused to know “How to be saved from such heart-breaking grief and repentance”. These verses have been causing to understand that your Lord, Whose Revelations will you accept after looking as the Truth on the Day of Judgment, you will be convinced that He and His Messengers (peace be upon Them) were True, today He desires to describe you through these verses that you should know Him today, and be saved from every kind of grief, repentance and anguish of the Day of Resurrection, and He, Lord is Allah Almighty (Eminent is God’s Glory), Who is Creator and Ruler of all. Behold! Nothing can be born at its own. Certainly anyone should be its creator. So you should understand from it that this vast arrangement of the heavens, the earth and the universe, in which, the sun, the moon and the stars have been doing their work at their own places. Something is moving whereas something is static. Sometimes it is day and sometime night. Somewhere is sunshine and somewhere shade, these entire have not been created itself. Their Creator is Allah (God) Almighty, Who is Lord of all of us. He gives Command to everything and everything obeys His Command. Nothing can disobey Him. Brothers and sisters! It is incumbent for you too that like other entire creatures, you should admit your God and Lord to Allah Almighty and call upon Him humbly and in secret, and do not overstep the bounds of your Lord’s obedience being deceived by the Devil. See! God has made arrangement to keep this earth up till a stated term and you have been settled here giving you the most powers and strength. By sending the Messengers (peace be upon Them) and Holy Scriptures, complete and manifest Guidance have been revealed for your deeds. You should not commit any such work in the presence of these Guidance, due to which, the violence spreads in the earth, because if corruption will spread, it will spread due to your own wicked deeds. Otherwise, all remaining sources of fair ordering have been performing their duty. If your acts would be good and you established the aim doing good works, then Mercy of Allah Almighty is nigh unto you and you will be saved from all disasters of the Day of Resurrection. 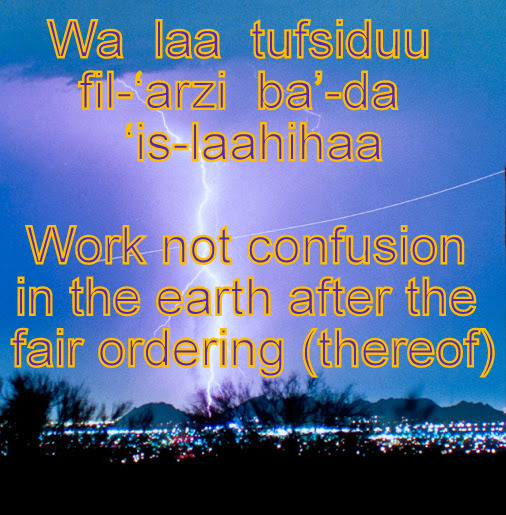 Work not confusion in the earth after the fair ordering (thereof) and call on Him in fear and hope. Lo! The mercy of Allah is nigh unto the good. Wa laa tufsiduu fil-‘arzi ba’-da ‘is-laahihaa wad-‘uuhu khawfanw-wa tama-‘aa. ‘Inna RahmatAllaahi qariibum-minal-Muhsi-niin. It was discussed in the previous lessons that this universe, which we see before us, it all has been created by Allah Almighty and His Command is obeyed by everything, which exists in it. He has appointed a proper way for every creature and that has been running under His control and in accordance with His Command. The humankind should think too that he is a creature of Allah Almighty also and for him, the Creator has determined a Divine Law for living in the world. Other all things cannot leave that path and law, which Allah Almighty has fixed for them, but the human being has more appearance of the power of choice and intention than all other living beings. Therefore, he should adopt the way by recognizing the Divine Law with careful consideration, and he can be driven back from that path also. This earth, on which the mankind has been dwelling, is running according to its prescribed Rules and Natural Law, and it will keep its footing until Allah Almighty desires to hold it. There is one kind of existing only on the earth i.e. the Mankind, who can ruin or decorate its form for himself to some extent. If the mankind went according to that Law, which has been prescribed for him, then the condition of this earth would remain arranged. But if he violated this law, then he will mar the condition of the earth for himself. The Devil, who is mortal woe of the human being, will try to repel him from the law by seducing, and his falling back from it will be cause of disturbance on the earth. In short, obeying the Commands of Allah Almighty is the fair ordering and violating the Divine Law is mischief on the earth, which means infringement. Allah Almighty commands that it was the method of fair ordering of the earth that the human being should be caused to understand the correct path. So, that has been manifest very clearly upon him. Now it is his duty that he should follow the instructions mentioned in that law, which has been prescribed for him (i.e. guidance mentioned in Holy Quran), otherwise a disturbance will be excited on the earth and there will be harm in it for him. For him, it is the method of calling upon Allah Almighty that he should obey His Commands and follow the instructions prescribed for him in the Divine Law, and disobey Him never by coming into the deception of Satan. The human being should fear displeasure and wrath of Allah Almighty, and be hopeful of His Mercy. Mankind should be known every time that the Mercy of Allah Almighty is nigh unto those people, who do good works in accord with the Divine Law and who do acts of Kindness with one another. 54b. His verily is all creation and commandment. Blessed be Allah, the Lord of the Worlds. 55. (O mankind!) call upon your Lord humbly and in secret. Lo! He loveth not the aggressors. 54b. ‘Alaa lahul-Khalqu wal-‘Amr. TabaarakAllaahu Rabbul-‘Aalamiin. 55. ‘Ud-‘uu Rabbakum tazarru-‘anw-wa khufyah. ‘Innahuu laa yuhibbul-mu’-tadiin. When you recognized Allah Almighty after looking at the Heavens and the Earth etc. and His system of establishing everything properly, then now; you should hear: What are His attributes? It was commanded in the previous lesson that after creating the Heavens and the Earth, mounted Allah the Throne being their Commander and the King. Allah Almighty is Unseen. Neither His Throne, which is called ‘Arsh, is visible to us, and nor we know the state of His sitting on It. But for causing to know us, He has described these matters in such form, as we see. Here, in the world, the king sits on the throne, which indicates that his order is enforced in his country. Just like this, the Order of Allah Almighty is enforced in the entire universe and the Throne of Sovereignty is in His control. The meaning of the words “mounted He the Throne”, mentioned in the previous verse, has been explained in this verse. It is commanded that the rulers of this world rule over the ready-made things but you should bear in mind that Allah Almighty is He, Who has created the entire things with His Omnipotence without any kind of support or help of any other. Then who can command these entire things except Him? God Almighty created the world, as well as, He established a system of administration into all kinds of creatures. Therefore, His Command is obeyed in every matter. Suppose! An engineer, who is at home in his job, draws a map of any heavy mills. He arranges all necessary machinery and parts, erects and fits everything at its proper place, details required skilled manpower for every job and guides them thoroughly; how to work. It is clear that his command will be obeyed at every step to run the mills, because except him nobody is fully aware of methods, machinery and management of manpower for the mills. 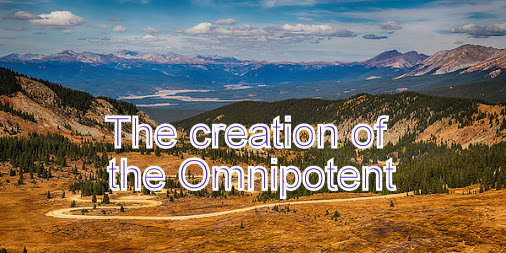 Similarly, Creator of the world, its Trainer, Organizer and Manager is That Lord of the Worlds, for Whom, every necessary thing is produced by His Own intention only. And He is, Whose name is Blessed. So, it is incumbent for the human being, who is a respectable laborer of these mills that he should call upon his Lord Almighty humbly and in secret, and ask Him only for help. He does not like aggressors and those who cross the limit of devotion, because while He is the sole Owner of everything, then how would it be useful to beg before any other. Lo! Your Lord is Allah Who created the heavens and the earth in six Days, then mounted He the Throne. He covereth the night with the day, which is in haste to follow it, and hath made the sun and the moon and the stars subservient by His Command. His verily is all creation and commandment. ‘Inna Rabba-kumUllaahul-lazii khalaqas-samaawaati wal-‘arza fii sittati ‘ayyaa-min- summas-tawaa ‘alal- ‘arsh. Yugshil-lay-lan-nahaara yat-lubuhuu hasiisanw-wash-shamsa wal-qamara wan-nujuuma musakh-kharaatim- bi-‘amrih. This description has already been being stated that everybody will know after death that his/her Lord is Allah Almighty and He had sent down His Messengers (peace be upon Them) along with His Scriptures (the Word) for the guidance of human being. That all was correct and true, whatever the Messengers (peace be upon Them) said and whichever was written in the Scriptures. But believing at that time (in the Day of Resurrection) will not be useful. Those people will be kept in the Garden for dwelling, who recognized their Lord and obeyed Him in the world, whereas those who were disobedient, will be sent in the Fire of the Hell. With effect from this Section, which description begins, that is: How to recognize our God in this world? Our Lord commands: look at the heavens, the earth, the day, the night, the moon, the sun, and the stars, and think that: How the system of this world is set up in order, established and organized in the best manner? Has it been established itself? No! Nothing can happen itself. A Creator of all these things, keeping them under an established system properly and completing them step by step, slowly and gradually, exists, that is One – Allah Almighty, Whom we can’t see today with human eye. Moreover, observing His Tokens and Signs, we can understand with sense and wisdom that He exists and certainly He is Existing. These entire heavens and the earth, created from the matter by Him, were completed after a long time and were set up at their proper places. The term of creating these things was six days, however those were not the days, which are determined by the sun, but measuring scale of those days is something else. 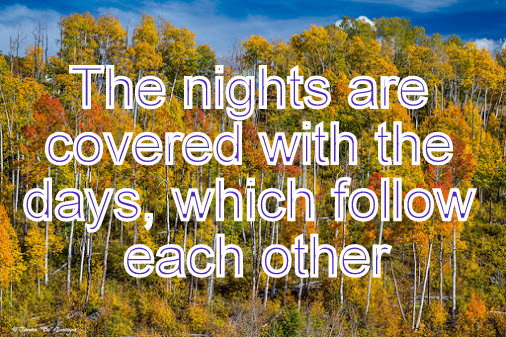 The Day, the night, the sun, the moon and the stars appeared slowly and gradually. Measuring of the days, when the skies and the earth were created, does not depend on them. Different but regular movements of these entire things depend on the Command of Allah Almighty. From them the days and the nights come running one after one, and these all are obedient and submissive to the Commands of Allah Almighty. We should know our Creator by meditating in all these things and believe in Him unseen, so that we may be saved from His wrath of the Day of Resurrection. On the Day when the fulfillment thereof cometh, those who were before forgetful thereof will say: The Messengers of our Lord did bring the Truth! Have we any intercessors, that they may intercede for us? Or can we be returned (to life on earth), that we may act otherwise than we used to act? They have lost their souls, and that which they devised hath failed them. Yawma ya’-tii ta’-wiiluhuu yaquulul-laziina nasuuhu min- qablu qad jaaa- ‘at Rusulu Rabbinaa bil-haqq. 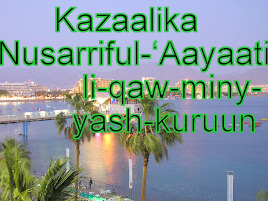 Fahal-lanaa min- shufa-‘aaa-‘a fayashfa-‘uu lanaaa ‘aw nu-raddu fana’-mala gayral-lazii kunnaa na’-mal. Qad khasiruuu ‘anfusahum wa zalla ‘anhum-maa kaanuu yafta-ruun. Consequence of the Believers and the disbelievers was expounded with complete detail in previous verses. 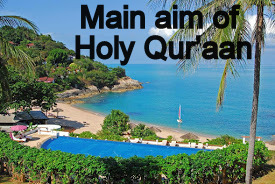 In fact, it is the main aim mentioned in the entire Holy Qur’aan, which is required to be understood, that if any individual desires own advantage and improvement, then it is necessary for him/her to move on the Path, which has been established by Allah Almighty through His Messengers (peace be upon Them) and Scriptures for the human beings. The last Messenger of God Almighty, Muhammad (grace, glory, blessings and peace be upon Him) and the last Scripture, the Praised Criterion (Holy Qur’aan) have placed before the world clearly, and caused to know the people thoroughly with every best method. Final summary of its teachings is: Those people who will act according to the Revelations of Holy Qur’aan, will be sent to the Garden for dwelling, whereas, on the contrary, those who will disobey its commands, their abode will be the Fire of the Hell. It is commanded that none can be saved from the death. After death, everything will come before everyone and then they will be sure that; that was hundred per cent correct, which was mentioned in the Revelations of Holy Qur’aan. At that time, it will come out from every evildoer’s mouth spontaneously: Truly! It was very glaring omission from us. Prophets and Messengers of Allah Almighty (peace be upon Them) used to say the Truth, but we ignored Their Sayings always being involved in the dithering of the world. On the Day of Resurrection, when the disbelievers will see with their eyes those matters, which they had forgotten in the world, will be confounded and they will be unable to find any form of escaping from the agony. Being disappointed they will cry: Would that, someone had saved us today from such misfortune, which is breaking down our nerves and had interceded for us in the Court of Allah Almighty OR we had been returned to life on earth, so that we might have shown doing good and fixing deeds. But at that time they will have no chance. They would have lost the opportunity of the world and ensnared their soul in the disaster due to wicked deeds and ruined themselves. Today (on the Judgment Day), their falsehood, which they used to devise in the world, will never be useful. Their companion will be none there except grief, anxiety, trouble, pain, fear and despair. 51b. So this Day We have forgotten them even as they forgot the meeting of this Day of theirs as they used to deny Our Tokens. 53a. Await they aught save the fulfillment thereof? 51b. Fal-yawma nansaahum kamaa nasuu li-qaaa-‘a yawmi-him haazaa, wa maa kaanuu bi-‘AayaatiNaa yaj-haduun. 52. Wa laqad ji’-Naahum- bi-kitaabin-fassalNaahu ‘alaa ‘ilmin hudanw-wa rahmatal-liqawminy- yu’-minuun. 53a. Hal yanzuruuna ‘illaa ta’-wiilah. Ta’-wiil – (to be fulfilled), origin of this word is ‘awala, which means “to return, to come back at own place”. The word ma-‘aal has been derived from it too, which means “antecedent, the end”. Ta’-wiil will be meant “to expose the last object, to fulfill that, what is said”. It was explained in the previous verses that those people will live into the Hell in the worst condition, who were disobedient in the world and they will ask alms from the dwellers of the Garden, but they will deny and say to them: We are not permitted to give you anything from here. Allah Almighty has expounded its reason in this verse. Our Lord commands: We shall forget these infidels on the Day of Resurrection and deprive them from the blessings of the Garden, because they did not draw their attention toward Our Revelations in the world and forgot the meeting of the Doomsday. They have seen today (in the Hereafter): That was True, which We commanded. But believing after observing is not useful. If they had believed in the Day of Resurrection during their life time in the world, that was advantageous today for them. Today is not the day of believing but it is the Day of torment for the disbelievers. 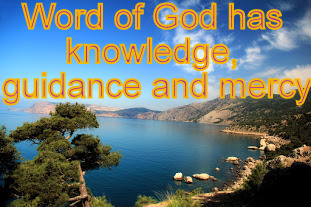 God Almighty will say: We had sent down Our Word unto them in the world. No random guessed matters did exist in Holy Qur’aan. We had expounded clearly which was written in it. The Scripture was entire proof and argument for the Believers. These people had sufficient wisdom and sense. It was not too much difficult for them to understand Our Book, if they had tried to draw their attention into it. O Messenger (grace, glory, blessings and peace be upon Him): Ask them today! What is the reason of your denial from acceptance, while everything has been described very clearly? Complete state of the Garden and the Fire has been expounded before you. Are you waiting now that every occurrence, which has been mentioned, should come in front of your eyes? Understand it carefully that it can never be so in this world. Here, you would have to believe in Our Word whole-heartily. You will see everything in the Day of Resurrection. 51a. ‘allazii-natta-khazuu diinahum lah-wanw-wa la-‘ibanw-wa garrat-humul-hayaatud-dun-yaa. ‘Afiizuu – (Pour), it is tense of command, which means, “You should pour”. The origin of this word is ‘afaazah, which has been derived from fayz. Fayz means “to flow, flood, flowing”. So ‘afaazah will be meant as: Pour. Here it aims: We are being burnt in the Fire, please pour some water of the Garden on us. It was explained in these verses earlier that when the dwellers of the Garden would have entered into the Garden and the dwellers of the Fire into the Hell, then the dwellers of the Garden will be pleased, looking before them those entire pleasing things, for which they were promised. They will think quickly that the disobedient were promised for the Fire. Indeed that promise would have been fulfilled certainly too. Therefore, they will address the disbelievers and ask them: We have found that which our Lord promised us (to be) the Truth. Have ye (too) found that which your Lord promised the Truth? Hereupon the dwellers of the Fire will cry: Yea, verily, that all was the Truth. After that, the conversation of the dwellers of the Heights (‘Al-‘A’-Raaf) with the dwellers of the Garden and the dwellers of the Fire was mentioned, which will be on the Day of Resurrection. At last, now it is being discussed that: What will say the dwellers of the Fire to the dwellers of the Garden? It is commanded that the dwellers of the Fire will call out aloud from the Hell to the dwellers of the Garden: Our bodies have been burning in the Fire. Severity of heat is unbearable. Pour some water of the Garden on us and give a few from those things also, which Allah Almighty has bestowed to you for rest and pleasure. The dwellers of the Garden will say as a reply to the question of the dwellers of the Fire: Allah Almighty has decided that the things of the Garden are forbidden for those people, who did not give ear and any importance to His Revelations, which He had established for living in the world, took their religion for a sport and pastime, determined the enjoyment of life for singing, dancing, outing and picnics. They were involved so much in worldly works that they thought never about the Hereafter. It is the reason that today they have been deprived of the Garden’s things. 46b. And on the Heights are men who know them all by their marks. And they call unto the dwellers of the Garden: Peace be unto you! They enter it not although they hope (to enter). 47. And when their eyes are turned toward the dwellers of the Fire, they say: Our Lord! Place us not with the wrongdoing folk. 48. And the dwellers on the Heights call unto men whom they know by their marks, (saying): What did your multitude and that in which ye took your pride avail you? 49. Are these they of whom ye swore that Allah would not show them mercy? (Unto them it hath been said): Enter the Garden; no fear shall come upon you nor is it ye who will grieve. 46b. Wa ‘alal-‘A’-RAAFI rijaaluny-ya’-rifuuna kullam bisii-maahum. Wa naadaw ‘As-haabal-Jannati ‘an- Salaamun ‘alay-kum. Lam yad-khuluuhaa wa hum yatma-‘uun. 47. Wa ‘izaa surifat ‘absaaru-hum tilqaaa-‘a ‘As-haabin-Naari, qaaluu Rabbanaa laa taj-‘alnaa ma-‘al qawmiz-zaalimiin. 48. Wa naadaaa ‘As-haabul- ‘A’-RAAFI rijaalany-ya’-rifuu-nahum- bisii-maahum qaaluu maaa ‘agnaa ‘an-kum- jam-‘ukum wa maa kuntum tastakbiruun. 49. ‘Ahaaa-‘ulaaa-‘illaziina ‘aqsamtum laa yanaalu-humUllaahu bi-rahmah. ‘Ud-khulul-Jannata laa khaw-fun ‘alaykum wa laaa ‘antum tah-zanuun. ‘Al-‘A’-RAAFU – (The Heights), it was described in the previous lesson that there will be a veil in between the dwellers of the Garden and the dwellers of the Fire. That veil’s name is ‘Al-‘A’-RAAF. The name of this Surah (Chapter) has been named due to this word. Its explanation was discussed in the beginning of this Surah. ‘Az-zaalimiin – (wrongdoers), this word is plural of Zaalim, which has been derived from Zulm. Actual meaning of the word zulm is “to deprive anyone’s right, not to give someone that thing, which was required to be handed him over. Zaalim means “tyrant, oppressor, cruel, unjust. In every sin, one’s own right or the right of any other is violated, so every sin is Zulm. In between the Garden and the Fire, some people will be standing on The Heights, who will be looking the dwellers of the Garden entering and living in the Paradise and the dwellers of the Fire in the Hell. These people will be hopeful of the Garden but, still they would not have entered into it. Their situation is being narrated here. It is commanded that those people who will be standing on the Heights, they will recognize both groups from the marks of their faces. At first they will call unto the dwellers of the Garden: Salaamun ‘alaykum (Peace be unto you). After that, when they will see condition of the dwellers of the Fire, they will seek protection of God Almighty and it will come out from their mouth spontaneously: Our Lord! Place us not with the wrongdoing folk. It is commanded that the people standing on the Height, will see some such people in the Fire, whom they were acquainted. They will recognize them due to their faces, appearance, marks and style. They will say to them: You used to slight everyone and dance on the strength of your allies and patrons. Why do they not set you free today using their tools and weapons etc.? You used to shrink from incurring an obligation. Pharaoh (king of Egypt), Haman (name of his minister) and Korah (“Qarun was one of the people of Musa but he lorded it over them. We gave him treasures, the keys alone to which were a heavy weight for a party of strong men.” (Surah Al Qasas 28:76)) were like a gnat before you. Where are today your large armies with their baggage and camp followers, your wealth and property, pride and haughtiness, those assistants of yours, who used to dance on your indication? Those entire are not of use today for you. At the other side, we see those people in the Garden, about whom you used to say: they are useless. Are these really those people about whom you used to say swearing: they are worthless and unprofitable people, how can they be blessed by Allah? 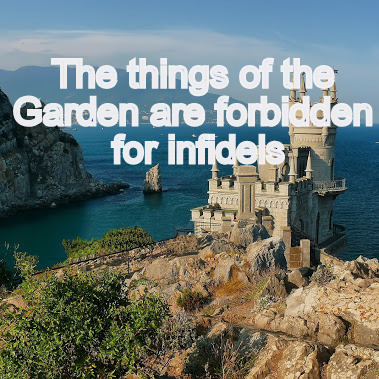 Can you imagine that those people live in the Garden, whereas the worthy, superior and excellent people like you, who were jack of all trades and unrivaled, may not go to the Garden? You used to say: the Heaven and the Hell are nothing but only a deception, which is self-invented against us by the people good for nothing, observing us in good condition in the world. Today it has been proved that they used to speak the Truth. 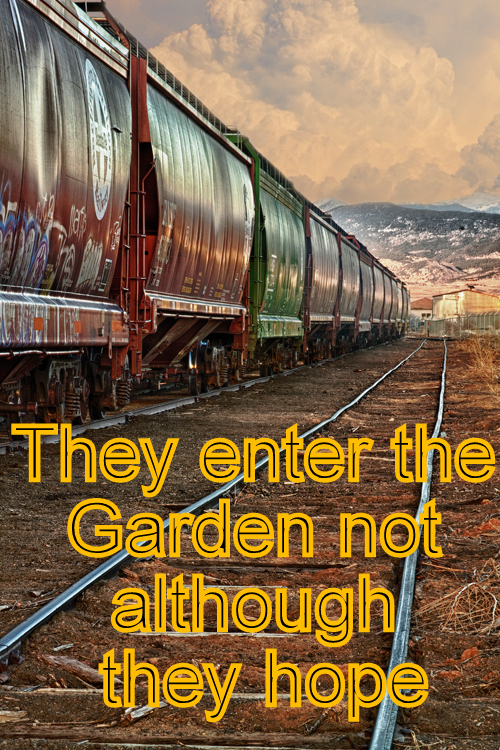 They have received a Warrant that they can go in the Garden wherever they wish. Such grief, sorrow, dreads and fear have been finished, which they used to endure from the hands of worldly people in the world. Unto them it has been said: Enter the Garden; no fear shall come upon you nor is it ye who will grieve.